Miliband forgets deficit in speech Jump to media player Labour leader Ed Miliband failed to mention immigration or the deficit in his speech because he forgot. Team Scotland 'saved our country' Jump to media player Ed Miliband says the Team Scotland of Labour politicians "helped save our country" in the Scottish independence vote. 'I met somebody called Elizabeth' Jump to media player Ed Miliband's speech is peppered with references to people he has met recently, including apprentice Elizabeth. Labour supports 'action against IS' Jump to media player Ed Miliband opens his conference speech talking about the British aid convoy volunteer kidnapped by Islamic State. 'Labour will balance books in fairer way' Jump to media player The shadow chancellor says Labour will "balance the books in a fairer way" as he set out plans for reduce the deficit. Gauging the mood at Labour conference Jump to media player An opening event for the Labour conference is the New Statesman reception where Andrew Neil meets MPs and delegates. 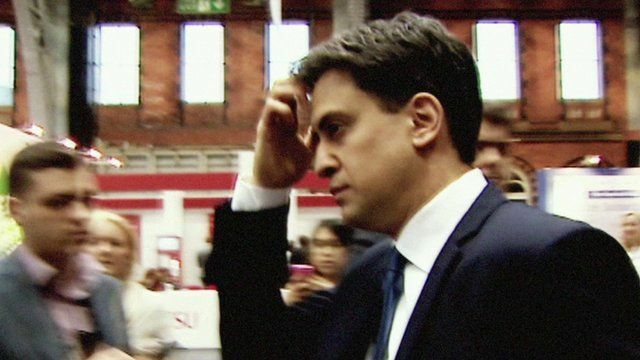 Labour leader Ed Miliband failed to mention immigration or the deficit in his speech because he forgot. He was speaking at the party conference in Manchester. Mr Miliband delivered the speech mainly from memory, without the help of an autocue and using only basic notes. Carole Walker reports from Manchester.